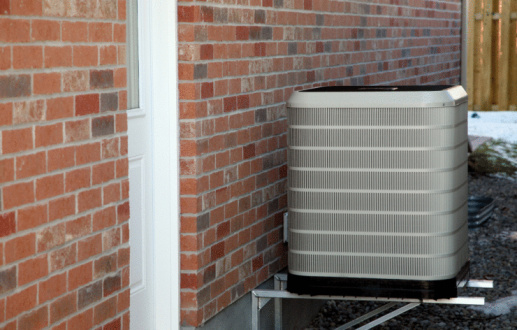 Founded in 1982, Goodman Manufacturing is an American company that produces heating and air conditioning equipment for residential and commercial customers. Goodman residential furnaces contain multiple limit switches to ensure safe operation. The primary limit switch, which prevents the furnace from heating to unsafe temperatures, is programmed to reset automatically after a malfunction. The rollout limit switch, activated when the burner flames are not being properly drawn into the heat exchanger, must be manually reset. Fortunately, resetting the rollout limit switch in a Goodman furnace takes only seconds. Flip the circuit breaker switch that corresponds to the Goodman furnace to the "Off" position to disrupt the electrical supply to the appliance. Remove the furnace access panel to get to the internal components. Grasp the sides of the panel and lift straight up to clear the retaining tabs on the bottom of the furnace cabinet. Note that some Goodman furnace models require you to remove screws along the side of the panel to free it. Set the removed access panel to the side. Locate the rollout limit switch on the burner assembly. Look for a rounded component with a raised red button in the center. Press and hold the red "Reset" button in the center of the rollout limit switch component. Hold the button for one to two seconds before releasing it.